as she retires after 14 years with the Surrey Food Bank. On June 28, community members, board members, staff, and volunteers gathered to give Marilyn a send off we’ll not soon forget. Chris Thornley and his 7-piece rhythm and blues band, Agent C and TOP SECRET, featured with outstanding music. And the evening was a joyful celebration of Marilyn and all she’s done for the community, as she was lead through stories and pictures, presented by friends and staff, twined together by the matchless humour of “The Late Show” host “Letterman”/Chris, and his side kick “Paul”/Councillor Bruce Hayne. Marilyn leaves a legacy of compassion, leadership and love for her community. 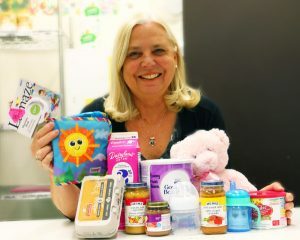 One of her many key initiatives was to launch the Tiny Bundles Program. And in Marilyn’s honour, those gathered for her retirement party brought donations to the Tiny Bundles program that totalled $2157.00, in addition to diapers, formula and a single donation of more than three hundred new teddy bears. We wish Marilyn every success and much happiness as she sets off on her next adventure.